I am a wife, mother, attorney, business owner, personal trainer, and drug-free professional bodybuilder. Did I plan to take on all of these roles? Absolutely not, especially not all at the same time. My life has been anything but a straight shot to where I am today. Growing up in DeForest, Wisconsin, I was a small town kid—and a busybody. I was raised and influenced by a whole community, but two individuals in particular—my grandmother and a nanny—fostered and honed my creative energy and curiosity. In hindsight, this is likely only because it meant I was busy learning instead of pestering them. They taught me how to seek out new challenges without a paralyzing fear of failure. I was allowed to try new things, make mistakes, and then try again. I was encouraged to push the boundaries of what I initially thought was possible and I was not allowed to stop until I figured out a reasonable solution. I was always rewarded based on effort and improvement and never the outcome. As a kid, I didn’t really know any better, but I know now that this was the single biggest factor in creating the life that I have today. I was surrounded by a community of good people who saw something in me that I didn’t always see in myself. I was just being a kid, doing what I loved, ignoring some of the “rules,” and letting my curiosity get the best of me. I had every opportunity to take a much different path in life, but for whatever reason a lot of people saw potential in me and helped keep me on the straight and narrow. They took me to practice when I didn’t have a ride, pushed me in athletics, held me accountable in school, and would go out of their way to make sure I had every occasion to learn, develop, and thrive. Many of them are now clients of my businesses and law firm, and I have the privilege of giving some support back to them. When I was in high school, my grandmother was hit hard with cancer. I watched the disease slowly tear her apart and was with her when she passed away. Not long after that, I also watched as my young cousin was taken by cancer. My eyes were opened to the fact that we are not guaranteed a day in this life. From then on, I have felt a sense of urgency as well as a sense of freedom to try new things and follow my heart. All of these factors were the foundation for the twisting path and right turns, switches, and stumbles to where I am now. At a very young age, I was involved in every single sport I could find my way into. I played soccer, little league baseball, and football with the boys. In high school I excelled in volleyball, basketball, and track and field, which ultimately lead me to the University of Wisconsin where I competed in varsity basketball and track. I was just 5’10’’ tall and 170 lbs. when I walked through the doors at the U.W. I was easily one of the smallest post players in the Big Ten Conference, and a whole lot of people counted me out. It was my responsibility, then, to learn how to make the most out of my underlying potential. I spent an incredible amount of time in the weight room with some of the best strength and conditioning coaches in the world. They made sure that my movement patterns were sound, that I was strong, that I was eating properly, and that the sequence of workouts I was subjecting my body to were helping to move me in the direction of my goals. In short, I had to work smart, efficiently, and effectively—there wasn’t any other option. I didn’t know it then, but these lessons would grow to become the core of our businesses at Hybrid and Bakke Athletics today. I graduated from the U.W. with a degree in Neuroscience and then attended Copenhagen Business School in Denmark on a scholarship, primarily in an attempt to delay being a “grown-up.” I think even then, although I didn’t consciously know it, I felt that getting trapped in the lives that I saw most adults living was something I didn’t want. I didn’t want the routine. I didn’t really want the mundane. I needed something more—I just didn’t know what that was. I will be the first to admit that while I was a disciplined student at Wisconsin, my education at Copenhagen Business School didn’t involve the same rigor. I didn’t spend a whole lot of time in classes or with my head in books. Instead, I spent time meeting people, traveling with them, getting to know their stories and their backgrounds. The whole experience was an amazing turning point in my life, and it opened my eyes to the fact that life is about a whole lot more than simply marching down this path of a variety of successes and failures. I learned that people mattered, and my experiences with people mattered even more. It opened my eyes to the fact that much of life’s happiness comes not from achievement, a paycheck, and our collection of “stuff,” but from how we impact real people. I wanted to do something that helped people be their best selves. I wanted to figure out what the world needed that my talents could provide. I think watching two of my family members die relatively early in life helped me understand and appreciate the value of our time here. Once we are gone, our chance to make an impact is done. Upon my return home I found a career with Epic, where I spent the next four-and-a-half years. It was a great fit for me early in my life. Epic gave me the freedom and flexibility to do work that I thought was interesting, work that was hard, and work that demanded my best. I didn’t have time to be bored. 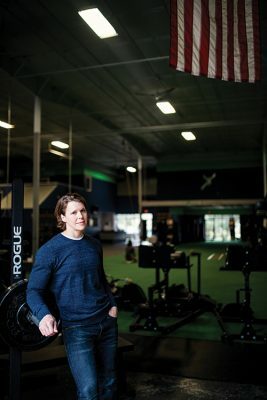 During my time at Epic, I continued to lift weights and use my science roots to identify effective and efficient training techniques and sound nutrition principles. I was collecting much of this knowledge and implementing these techniques for purely selfish reasons. I wanted to be the best I could be, and if I wanted to make any progress while facing the demands of my career at Epic, I needed to be efficient. In the back of my mind I was always thinking of ways to actually make money from my “hobby.” I saw swarms of young professionals at Epic move from being reasonably fit young adults to relatively sedentary and unhealthy in as short as two years’ time. I escaped that trend using the techniques I was using and knew there was value in it—I just didn’t yet know how to monetize it. When I finally hit the point at Epic where I started to feel that I was just dealing with the same problems in different clothes, I knew I needed a change. I also had this idea that if I didn’t leave Epic soon, I was going to get myself into normal adult commitments (which I avoided at all costs to that point) that would make it exponentially more difficult to take a big leap of faith away from the safety and security that Epic provided. I started searching for what my next risky yet semi-secure move was going to be. I had several friends who were lawyers and saw two opportunities in law school. First, it allowed me to be a student again, which was a big win. Second, I felt that law school could give me some valuable tools regardless of my ultimate career choice. While most people complain about the demands of law school, it actually provided me with the flexibility and mental space I needed to figure out how to make money doing what I loved—athletics. I finally had a relatively set schedule and saw an opportunity to use all that I had learned to compete in a drug-free bodybuilding competition. My first contest was in the spring of 2014 during my second year of law school. I won that show and earned professional status. I then competed in the fall of that same year in WNBF World Championships, finishing eighth. From there, people’s interest in my story, my techniques, and my coaching ability began to grow. This was the very beginning of my march to where we are with our businesses today. Throughout the next two years, I continued to compete and win competitions across the country from Sacramento to New York. I knew I had plenty to learn but was willing to put in the effort and stay patient. Somehow, with the right combination of work and luck, my life presented the right opportunities at the right times. Demand for my consulting services grew with each subsequent contest win, and I made the decision to start Bakke Athletics in early 2015 while I was still in law school. Following graduation, I began work at Michael Best’s Madison office as a patent and trademark attorney in the litigation department. While I loved the difficulty of the work that I was tackling at the firm, I knew relatively early on that I wasn’t going to be happy or fulfilled doing that work forever. Life has always steered me back to the idea of making a living from my love for athletic performance and bodybuilding, and I simply couldn’t do that while handling the demands of being an associate at a large law firm. The following year, in 2016, I made the decision to leave the epitome of what most law school students dream of—a great job at a large law firm with fantastic colleagues. Walking into my supervising partner’s office that day was equal parts terrifying and exciting. I was very aware that I could simultaneously be making the best and worst decisions of my life, but somehow I knew it was the right move. I quickly took steps to form my own practice while finishing up some responsibilities for my clients at Michael Best, and was spending time growing Bakke Athletics. I was also scheduled for a bodybuilding contest two weeks later! I used nearly every minute of the next two weeks working on something—websites, finding software for my law practice, client needs, and making sure I was ready for my contest. I was stressed—but having an absolute blast. The expectation that I was the “expert” was lifted and I let myself approach things with kid-like curiosity again. For the first time in a long time I was free from all of the things I was “supposed” to do, and I was able to do things that I wanted to do, the way I thought they should be done. Two of the coolest transition weeks of my life flew by. I competed on May 14 of 2016, took third, made the decision that I was going to take some time away from competing as a bodybuilder to add some size and finally recover my body—and then my wife entered my life. Literally that same night. The night that I competed, a mutual friend had a birthday party. Stephanie and I both worked at Epic around the same time, and I remembered her from there, but our interaction was limited to time spent in the same meetings. To set the stage a bit, you need to understand what I look like after I have just competed in a bodybuilding show. I had an unnaturally dark tan, I hadn’t showered in over 48 hours, I still had the remnants of “glaze” on which is intended to give us a sheen on stage, and there is something about the smell of the tanning products that we use that lingers in the worst way. So, that was me, looking and smelling like I desperately needed a shower. And I literally saw the most impressively stunning human being I have ever seen across the room. She made eye contact and then her gaze snapped away, indicating that she was either incredibly interested but shy, or not at all interested—either way, I was going to track her down. Thankfully, she was the one that eventually sought me out that night, and the rest is basically history. Fortunately for me, Steph identifies with my need to live outside the lines a bit. Steph grew up in small town Chippewa Falls, Wisconsin, and got her start in trying new things when she left for college in Alaska, where she ultimately lived for eight years. 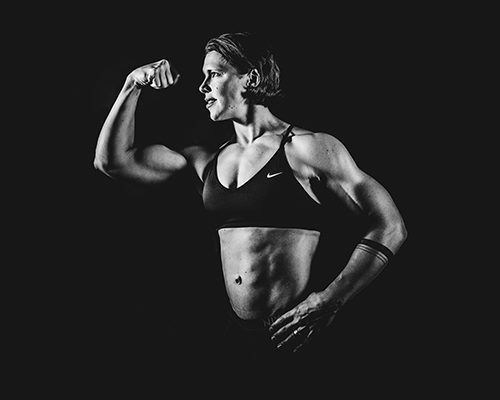 She too played college basketball, and a fundamental part of her life involved weight training and nutrition, even during her professional career at Epic. As our relationship grew, and we realized that being away from each other was basically torture (we are that strange couple that could spend every minute together), we started talking hypothetically about opening a small gym to accommodate some of the requests I was getting to do hands-on training with groups and individuals, and to allow her to step away from Epic and the travel demands that her career required. I was planning on continuing to run my law practice, and eventually Steph would move into a more operational role for the gym. In January of 2017 we took a month-long trip to South Africa, where we did some volunteer work and toured the country. We began more seriously discussing the details surrounding the gym idea on our way home, and like most things that involve my decision making, we went from 0 to 100 without really even knowing it. We got a call in the airport with a tip that Hybrid Athletic Club may be for sale. Within three sleepless weeks of that call the deal was done and we were on our way to starting some significant improvements to the equipment and facility. Also, typical of how Steph and I work—we bought the club on a Tuesday and were married that Friday. Our goal in creating the current Hybrid was to reach more people in the general public that were struggling with how to lose weight in a sustainable and healthy way, and improve their training under the demands of busy careers, children, and the normal pace of daily life. Anyone who knows me fully understands that my wife is my world. We frequently get questions about how we balance our businesses and family. In all honesty, my wife and kids always come first—my commitment to them may require some very early mornings, late nights, and a little creativity—but we always find a way to put our family first. We have become pretty good at allocating time and mental energy to everything in our day according to importance. We don’t let our emotions and energy get hijacked by relatively insignificant bumps in the road, which allows us to work very efficiently, make time for each other, time for our kids, and move forward with all the good that we have going on. The biggest challenge we have had together is managing the growth of our businesses and my law practice in a way that preserves the quality and personal touch of our work while still balancing family life. We simply won’t compromise on the quality of either. Every single business decision we make starts with a close evaluation of how it will impact our family and our client experiences. For example, when we first started at Hybrid Athletic Club I was training clients 10–12 hours a day, six days a week because I wanted to ensure that the people who were buying training were getting a very high level of service and education. As a result, our clients have now come to expect a lot of personal attention and individualized guidance. In December of 2017, our twins were born and required a couple weeks in the NICU. That was the first time in a year I stepped away from the gym, and since then I’ve weaned away from those long hours in order to spend valuable time raising my family with my wife and attending to the needs of my law practice. In order to continue to provide a very high level of service, we have built an extremely talented and well-educated team around us. I am so impressed by, and proud of, the current members of my training teams and their abilities and attention to detail. One of our greatest business and personal challenges is finding time and space to experiment with new business ideas. Developing these ideas and figuring out all of the logistics that are required when you set out down a new path takes time and mental resources that aren’t always available with three thriving businesses and twin babies. We have a list of business ideas that sits in waiting until I either get so impatient that I need to move ahead with one, or we have time and space that opens up. On occasion the lack of time necessary to explore some of these ideas is hard for me. I struggle because I get so excited about the potential for some of our new ideas to help people. Sometimes I miss the “kid” feel of exploring something brand new for the first time. We stay patient, though, and work through what we need to in order to get to what we want. As a gay woman growing up, the people in my life that helped me embrace productive failures also helped me to understand that we needed to be 100% authentic without fear of rejection. To find true peace, I needed to let the armor go. Early in life I found that sometimes our need for acceptance by society could make us invisible. I never wanted to be just like everyone else. I wanted to have my own style. I wanted to have my own voice. We have brought those lessons to our businesses and they have thrived because of it. Everyone who walks through our doors knows we are a gay family. We are open, honest, and transparent. I could not be more proud of my relationship with my wife, and it is at the center of who I have become as a person and professional. 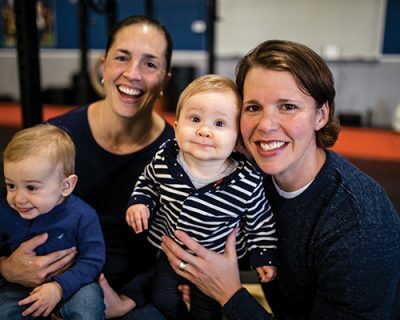 We are fully aware that there are some people who will not consider being members at our gym, or clients of my law practice, simply because we are gay; and to be honest, that has been one of the things we really haven’t had to worry about. We set out to open a gym so we could share the knowledge, lessons, and skills that we have developed over the last 16 years. We focus on quality. We focus on educating our clients. We genuinely care about every person that is a part of Hybrid and Bakke Athletics. We care about the quality of services we provide. We don’t care whether you have just started lifting or whether you are a world-class bodybuilder. Both train at our gym and we help both make progress in the direction of their goals. The attention to quality and true understanding of each client that walks through our doors has always come first. I think the fact that we care so deeply about our client base has helped even those people that may initially be a bit resistant to accepting us as a gay family feel comfortable to the point where they genuinely care about me, my wife, and my kids. Our attention to every member that walks through our doors has helped us create what is perhaps the most diverse fitness facility in the area; and yet it has a family feel every time you visit. Although I never planned on any one of these particular businesses or careers growing up, all of my life experiences blended together to create the life we have now. It takes a sense of curiosity, a sense of adventure, a constant desire to learn and try new things coupled with an open eye for opportunity. And then, a gut-check just before leaping.